Chronicles of Zostera: POSTER AWARD!!! So, as it turns out, I recieved an award for the poster I made presenting my scallop survival poster at the National Shellfish Association's 100th Annual Meeting last month in Providence, RI entitled "A Bay Scallop's Brave New World: Can the introduced Codium fragile act as an eelgrass surrogate?" Your poster presentation entitled “A bay scallop's brave new world: Can the introduced Codium fragile act as an eelgrass surrogate?” at the 100th National Shellfisheries Association meeting in Providence, Rhode Island, has been recognized with our Association's Gordon Gunter Award for Best Student Poster. As a recipient of the Gunter Award you will receive one year of free membership to the National Shellfisheries Association, which includes a subscription to the Journal of Shellfish Research. On behalf of the society we applaud your efforts. This really made my day, and makes me excited to finish writing the report for the EPA and turning it into another manuscript. 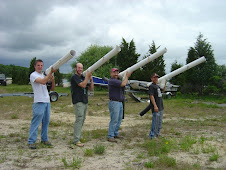 Bay scallops, Argopecten irradians, once supported a vibrant fishery on Long Island, but were pushed to the brink of local extinction after a series of brown tide blooms in the 1980’s. Restoration efforts, which commenced at the time of the fishery collapse, were somewhat successful but since 1995 scallop populations have remained well below historic levels. Despite many reasons for this lack of recovery, loss and alteration of habitat is often considered the major player. The potential role of the existing eelgrass (Zostera marina), the preferred bay scallop habitat, and macroalgae as suitable bay scallop habitat was investigated at 4 time points over 2 years. 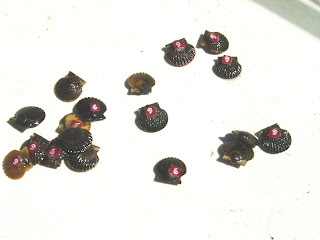 Tagged juvenile bay scallops were free planted to the bottom and tethered in 6 different habitats for a period of one week and percent recovery was calculated. 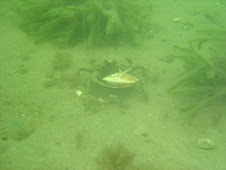 Recovery numbers were highest in eelgrass, however, dense stands of Codium fragile exhibited statistically identical recovery to eelgrass. Eelgrass and codium both performed significantly better than replicate releases on bare sediment and dense drift macroalgae. 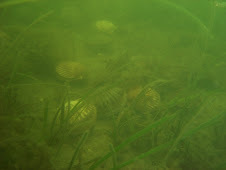 These results can help managers to plan more efficient restoration efforts by locating potential habitats where scallop survival would be highest, even in the absence of eelgrass.